Ya'll may think I'm crazy, but part of the seven (7!) different edible greens we got in our Community Supported Agriculture (CSA) farm share last week was a double amount of beet greens. I'm happy to have them, and I completely understand how something that caused a tummy upset in the past is something to be avoided in the future--which is what caused my benefactor to bequeath her greens. A few weeks ago, for the first time in 15 years, I made sesame peanut noodles. I thought I was ready for them, but no--memories of the tummy bug we caught the night of my son's first birthday party were still too strong. At least my folks liked them this time around. When I've got double the greens--and not a lot of solo breakfast opportunities because everyone is constantly underfoot--I needed to think past my beloved beet green breakfast into something the whole family may get excited about. 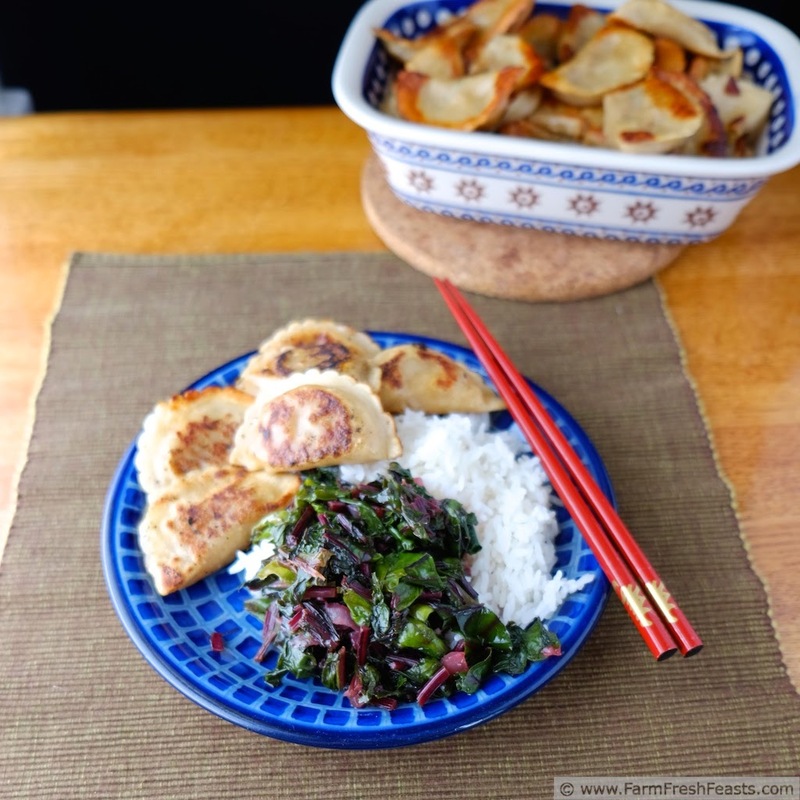 When I saw mandu marked down at the grocery store I decided to make a slightly Asian twist on my beet greens. It worked out well enough that I made this side dish a second time this past week. I think this recipe would also work well with Swiss chard, and probably spinach too. We've been drinking up kale lemonade smoothies so much that there's no really any kale left for cooking, but perhaps that would also sauté well. Especially after a massage. I'd be happy to sauté well after a massage, come to think of it. Preheat a large skillet over medium heat, and add fat. Sauté onions and beet green stems until starting to soften, about 5 to 8 minutes. 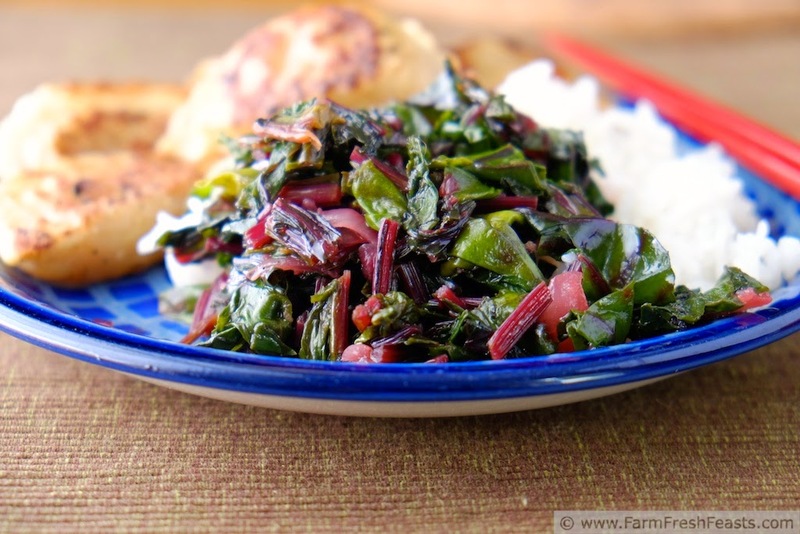 Add beet green leaves, stir to coat with fat, and cover for 3 minutes until wilted. Remove cover and sauté another 3 to 5 minutes until tender. Remove from heat, add a Tablespoon of seasoned rice vinegar, a generous pinch of salt, and a few grinds of pepper. Taste and add additional salt, pepper, or vinegar as desired. Note: If you want, use a teaspoon of soy sauce or tamari in place of the salt. Another Note: If you don't have seasoned rice vinegar, don't worry. Plain rice vinegar will substitute just fine--the little bit of sweetness will not be missed. Ooh! Rumor had it that I will be getting beet greens in our CSA box today! Keeping this one in mind for sure! Has, not had. Darn autocorrect. What does it say about me that I'm hearing Adele's song in my head now? I've been grooving on all the beet greens we've gotten this season. I'd saute well after a massage too. Heck, I could probably use one of those right about now. The Hubby accidentally put Bok Choy in his lunch time wrap and then told me the lettuce tasted funny. Thought you'd get a kick out of that. I'm snorting picturing your spouse's first bite and puzzlement, but how inventive of him to use Bok Choy in a wrap! I'm going to try it in place of spinach in a pie (with feta) tonight. 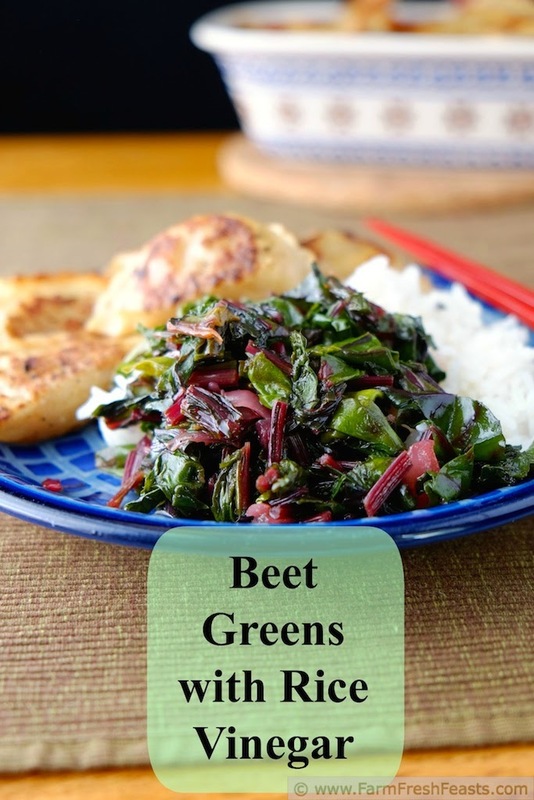 I really like beet greens although sometimes they can be a bit much. I like the idea of the vinegar to balance them out! I grew up with the splash of vinegar on our garden Swiss chard, and just like Rachael Ray uses nutmeg with her greens I like vinegar with mine. Thanks!